The phenomenon most of us recognize as contemporary freakshows began in the 19th century, but the roots of such shows actually extends back to the 17th century. During that time, individuals with medical conditions that radically changed their appearance would earn a living by traveling and putting themselves on display. Some of these performers, such as Lazarus and Johannes Baptista Colloredo—who were conjoined twins whom were physically unable to make a living by conventional means of the time in their native Italy—were left with few options. As more people with such deformities began to follow this course of action, “freaks” became a fringe culture of society at the time. Their popularity continued to grow until, in the late 19th century, entertainers, such as P.T. Barnum, gathered several such individuals and promised to share profits with them in exchange for doing all the promotion. Hence, the freakshow was born. Aided by the relatively new technology of photography, some freakshow performers were able to achieve a level of fame that has lasted well into the 21st century. Lets take a look at some of the most famous freakshow performers in history. 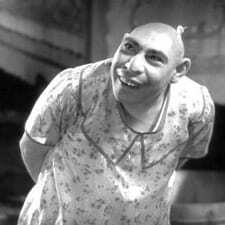 Schlitzie the Pinhead, also known as “The Last of the Aztecs,” was actually not an Aztec at all. Rather, Schlitzie was born in The Bronx with a condition known as microcephaly, which has been in the media again recently as it can be caused by the Zika virus. Characterized by a small skull and brain, it causes severe mental retardation. Standing about four feet tall, Schlitzie was able to speak several short phrases, but needed assistance with many other daily tasks. He lived to be 70 years old, however, until his passing in 1970. The star of the W. H. Harris’s Nickel Plate Circus, Ella Harper was born with a condition known now as genu recurvatum. This conditions allows one’s knees to hyperextend and actually bend in the opposite direction knees normally bend. 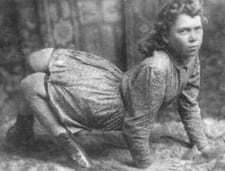 As such, it was most comfortable for Ella to walk on all fours, earning her the name, “The Camel Girl.” While the condition had a pronounced effect on her physical state, her mental capacities were completely normal. Upon her departure from the circus, her intentions were to go to school. Charles Sherwood Stratton was actually a relative of P.T. Barnum. When Barnum learned of Stratton’s dwarfism, he sensed opportunity. Barnum took Stratton under his wing and taught him how to sing, dance and impersonate famous historical figures. 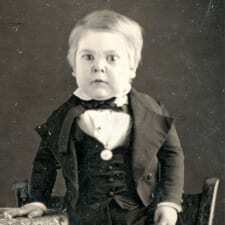 At the age of 5, Barnum presented him to the world as, “General Tom Thumb,” making Stratton lie about his age and say he was 11, as to make his small stature seem even more remarkable. 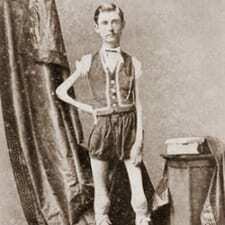 Stratton performed with the circus for 40 years, until his death in 1883. In that time, he amassed a fortune that would make him a millionaire in today’s dollars. In fact, he even bailed out Barnum’s circus during a particularly difficult time. During his life, his fame earned him encounters with Abraham Lincoln and Queen Victoria. In his adult years, Stiles became an abusive alcoholic. He actually murdered his daughter’s fiance on the eve of their wedding in 1978. After pleading guilty to third degree murder, he was sentenced to 15 years of probation, because there were no prisons capable of caring for someone with his condition. In 1992, a nearly karmic turn of events took place as his wife and son from a previous marriage hired yet another sideshow performer to murder him. Stiles was shot in the back of the head three times while watching television. 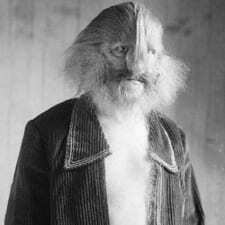 Born Stephan Bibrowski in 1891 Poland, “Lionel the Lion Faced Man” endured a medical condition known as hypertrichosis, which is also commonly associated with “Werewolf Syndrome,” for obvious reasons. In an odd twist of fate, his mother was convinced the condition was caused by her witnessing his father being mauled by a lion while she was pregnant. Still, that was a coincidence… albeit it a crazy coincidence. Unable to handle his appearance any longer, she put him up for adoption when he was four years old. He was adopted by a German entertainer who put him on the circus circuit. Despite the original reactions of fear from circus patrons, they warmed up to Bibrowski’s pleasant demeanor and he is reported to have spent much of his time conversing with circus-goers—which was relatively easy for him, as he spoke five languages. Sprague was born in Massachusetts in 1841. 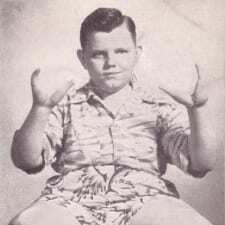 Up until the age of 12, he was considered completely normal. It was then that his muscles started to atrophy. Before long, he had barely any muscle tone left. At age 24, he was rendered unable to perform any other jobs and, as such, joined P.T. Barnum’s circus as “The Human Skeleton” or “The Original Thin Man.” He died in 1887 of asphyxia, likely related to his muscular condition. He was measured by a doctor just two years prior at age 44. He was five feet six inches tall and weighed a mere 43 pounds. 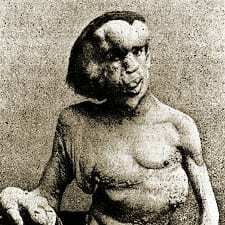 While other performers on this list suffered from a clearly diagnosable malady, Merrick is believed to be living with several conditions that, in conjunction with each other, led to his abnormal appearance. Oddly enough, Merrick’s mother thought the condition was caused when she was scared by an elephant when she was pregnant… so apparently, this was a thing. Merrick’s skin and bones were covered with a series of protrusions, growths, and tumors. As such, his appearance made it difficult for him to procure work. He turned to the sideshow as a way to make a living, only to have a manager steal nearly all of his money several years later. He later became a resident at the London Hospital, where he could receive care and be subject to study. During that time, he became a minor celebrity and received many visitors, including, among others, Alexandra, Princess of Wales, before succumbing to asphyxia in 1890. 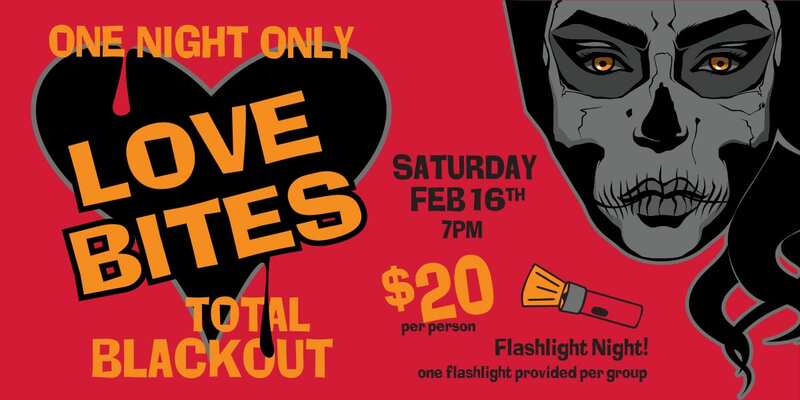 Which Freaks Did We Miss? So there you have it; your abridged guide to famous freakshow performers. Who did we miss? Please feel free to share your comments and suggestions below!